Plaited into a circle, the simplest and most perfect of shapes, with a nod to the Sun, flower wreaths were used as decoration from the beginnings of time. 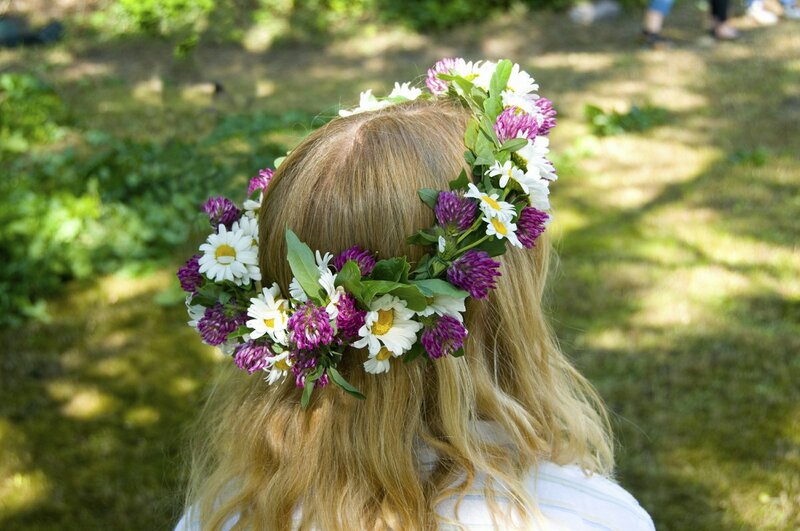 Whilst elsewhere, with the growth of politics and states, crowns developed into symbols of power with precious metals and jewels, Latvians to this very day never stopped wearing their flower wreaths, mainly at Midsummer. Women and children scour the meadows for plants, flowers and herbs known for their healing properties or other qualities. A day spent with hands The flower wreath green and sticky from sap, breathing the pungent dizzying plant aromas and vapors with bees hovering around your head is a very powerful kind of grounding ritual performed without much thinking, with great delight, since ancient times. For men, the choice is limited to oak leaf wreaths made for them by the women of the household. In folklore, a wreath or a crown worn by an unmarried woman was the mark of maidenhood – taking off the crown denoted getting married. A stork family nesting close by is the ultimate seal of approval from nature – this place is green, clean and safe. 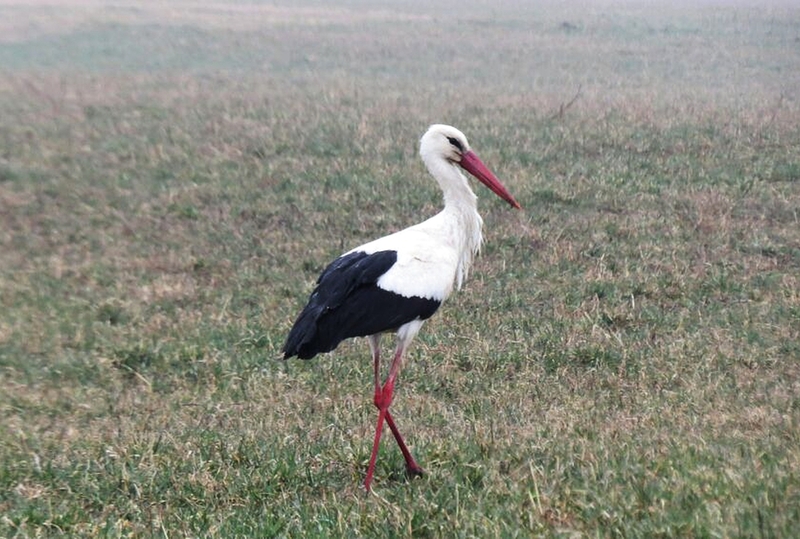 Consequently, the return of the storks in spring is a much-awaited emotional marker of nature’s cycle of life. Around 5% of the world’s white storks nest in Latvia – over 10 000 nests have been counted on utility poles, tall trees and chimneys. If these graceful birds dwell nearby your house, you can expect all the desired blessings: prosperity, babies, happiness, weddings and harmony in the household. A more elusive specimen is the white stork’s slightly smaller brother, the black stork, an increasingly rare bird in Europe. The Latvian Fund for Nature offers a remarkable opportunity: the life of these and other quite rare birds is live-streamed on the Fund’s homepage. Apparently, it is very engaging, as 8.5 million viewers have been counted in 2017. The bathhouse ritual means profound cleanliness inside and out and is still as popular today as any modern beauty treatment. 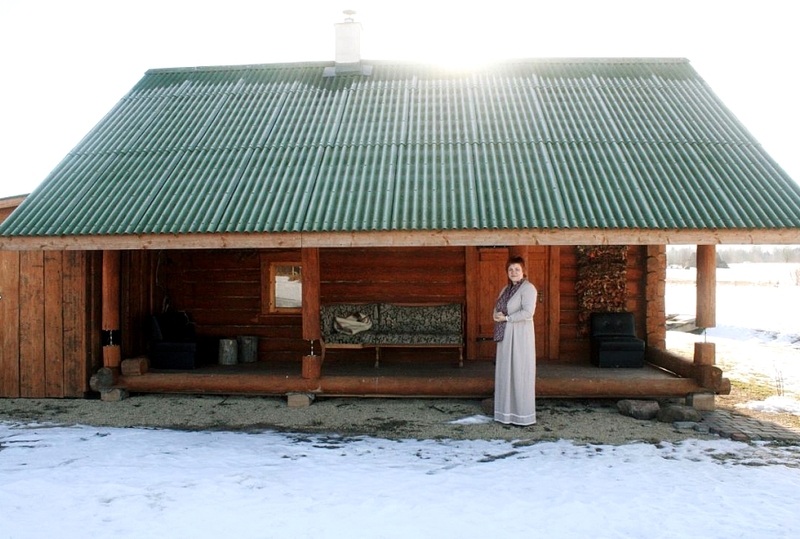 It is not so much about the place, it is about the senses – be it a small authentic bathhouse in Latgale or a luxury spa in a palace. You sweat out your body’s impurities, scrub and swat yourself with a bunch of birch leaves and other specially selected plants. The heat and heady aromas are a form of meditation for the body and soul. Rolling naked in the snow straight after, or immersing yourself in cold water are optional extras that are great for circulation, and calmly sipping cups of honey flavoured freshly brewed herbal teas is popular. Formerly, purified by the high temperature, the bathhouse was a good place to give birth and a resting place before burial, earning the bathhouse the mystical and symbolic role of a gateway between two worlds.